If you grew up in the '90s, then there's a good chance you were obsessed with *NSYNC growing up. There's also a good chance you never grew out of your teenage obsession with Justin Timberlake, JC Chasez, Chris Kirkpatrick, Joey Fatone, and Lance Bass. 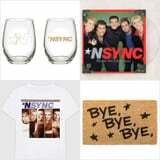 While the boy band may not be together anymore, you can keep your love for the band alive with these gifts. From '90s t-shirts to collectible wine glasses, you'll want to "buy, buy, buy" every item.